Commodity currencies were trading nervously in the run up to an announcement from the RBNZ’s monetary policy committee. New Zealand’s reserve bank is widely expected to lower rates by 25bp to 3.0% today. However there is an outside chance of the rate being cut by 50bp and that is currently being echoed in the depressed levels of the “kiwi”. A smaller cut could therefore see NZD rising to pare back some of the brutal falls that have taken place over the past three month. 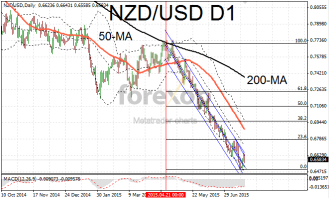 NZD/USD is significantly oversold on the upper timeframes. The pair fell today for the first day in three. 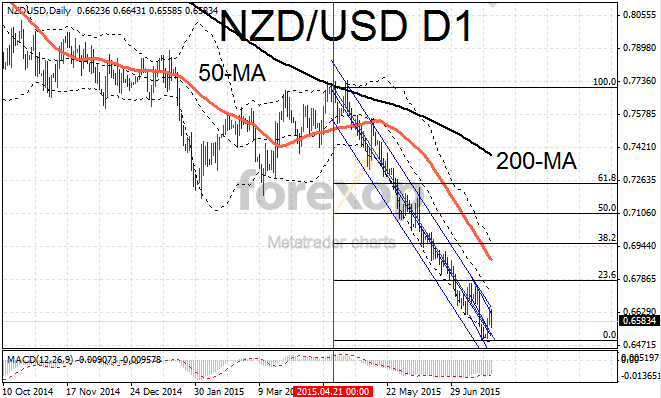 Moving down to 0.6583 NZD/USD remains trapped in a tight downwards trend channel (see figure). NZD/JPY was also trending lower and remains in a similar pattern. The low of 80.44 reached last week hasn’t been revisited but at 81.64 remains firmly within a downwards trajectory. Following the kiwi lower the Australian dollar is also suffering from deterioration in sentiment. Inflation figures released this morning were supportive but they were not enough to reverse the strong downward push as markets position against possible easing of monetary policy. The trimmed mean CPI increased by 0.6% in the second quarter compared to the first quarter. This was ahead of the consensus forecast of 0.5%. AUD/JPY slid back to 91.42 failing to extend through on a brief rally. AUD/USD also eased by 0.7% falling back to support at 0.7368. Growth in China remains central and the poor outlook is causing a “knock on” effect on the commodities sector. Metal prices were weaker on Wednesday following yesterday’s mini rebound. Gold, copper, and iron ore were lower. Crude oil dropped to 50 cents to $56.35 though some of the move was down to a stronger dollar. Inventories were up this week according to the EIA’s latest report. Crude supplies were up nearly 2.5M barrels last week defying analysts’ expectations of another cut back.